The balustrade to the Queen’s Staircase at Hampton Court Palace was designed and made by the Huguenot ironsmith Jean Tijou most probably in 1694-96. Tijou seems to have arrived in England with William III and Mary II and was active here from about 1688-1712. His most notable work at the Palace was the screen composed of twelve panels, which now bears his name, and can be seen, where it was installed in 1701, at the river end of the Privy Garden. 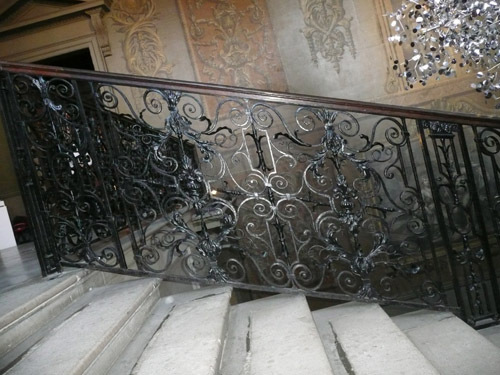 The balustrade is of wrought iron in panels with scroll and acanthus leaf ornament and the handrail is of mahogany. It seems not to have been installed until some five years after completion as most of the work on the Queen’s apartments was halted on her death, in 1694, and only resumed in 1699. “taking down the ruff steps of stairs and partitions and shoring the half pace of the queen’s grate stairs”. The paving of the Queen’s staircase also takes place in this month, making it possible that the ‘great staircase’ in this instance, refers to the Queen’s, rather than the King’s Staircase. 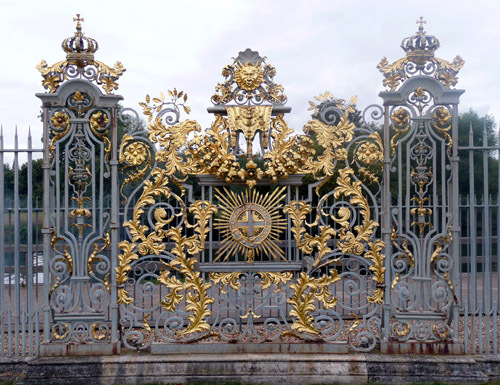 But it is possible that the ironwork when it was primed, was still in Tijou’s workshop. 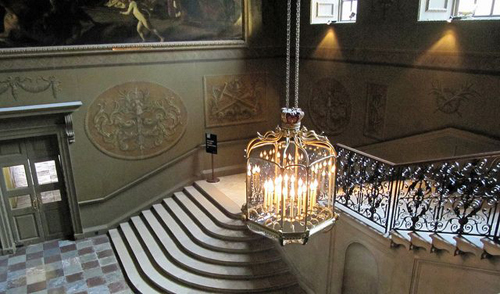 There is no account for initial colour or of any gilding of the Queen’s staircase. “the staircase leading to the Queen’s Great Apartments at Hampton Court was never completely finished and the wainscot whereof is much out of repair for which reasons we humbly are of the opinion that it would be advisable to take away the wainscot and embellish the walls and ceilings of the same staircase which are at present only whitewashed with ornaments painted on canvas and chiaro oscuro, the charge whereof if it be your Lordships’ pleasure, £456″. The ceiling in the Queen’s Staircase was painted in 1734 by William Kent, who also designed the Duke of Cumberland Suite in the Palace. The ceiling of the Queen’s Staircase has a trompe l’oeil dome with the star of the Order of the Garter at its centre. On the west wall is the painting Mercury Presenting the Liberal Arts to Apollo and Diana by Gerrit van Honthorst, of 1628. Twenty samples were taken of the minute fragments of paint that had survived. The majority of these were found in the folds of the leaves or in the centre of the scrolled elements. In very few was there a clear stratigraphy and, even then, it was never complete. 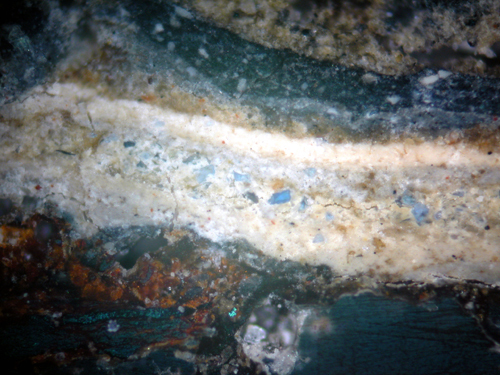 However, two samples showed quite clearly that the balustrade was blue originally and that this colour was achieved using the cobalt blue glass pigment Smalt. 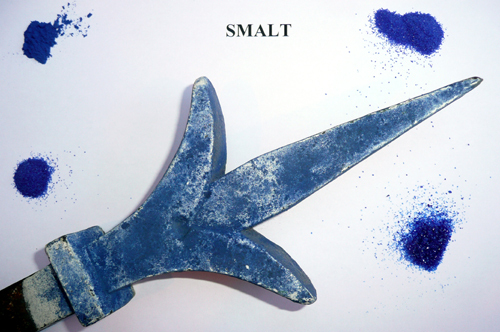 Smalt is not a pigment often seen in house-painting and seldom in easel painting. It is a potassium glass of a blue colour. The blue is due to small but variable amounts of cobalt added as cobalt oxide during manufacture. It has been found that potash (potassium oxide) glasses are less stable than soda glasses and that excess potassium may be leached out in an oil medium. It is also known that the cobalt ion migrates from smalt particles and that their subsequent interaction with the paint medium is another cause of the reduction of colour in the pigment. Just one of the twenty samples displayed a complete initial sequence. 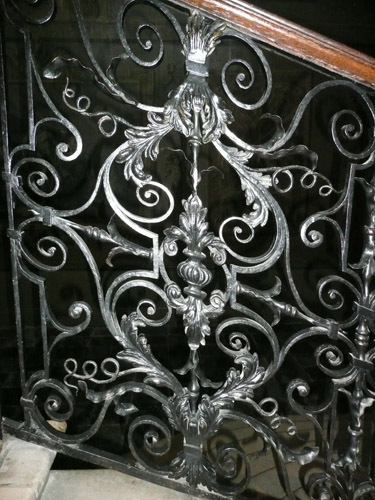 Rust and tiny pieces of iron could be seen at the bottom and the balustrade was painted twice with an oil paint composed of lead white3 and small amounts of chalk. A base coat of lead white in oil with small amounts of smalt was followed by a top coat with more particles of smalt. The smalt had lost its colour over time and one could see that it was only the few larger pieces in the top coat that were still quite blue and that the smaller ones were a washed-out blue-grey. As the larger pieces could only be seen in the top coat it is possible that the smalt in this first scheme had been ‘strewn’ i.e. scattered onto a still-sticky first coat. Strewing smalt was generally coarser than oil smalt. A second and third smalt scheme were employed and these were made up of larger and more colourful particles of the pigment. At some time the newly-invented Prussian blue was applied. Evidence of later green and black schemes could also be found. As with so many of my projects the decision as to which scheme to choose for redecoration (should that even be considered) is not immediately clear. It seems likely that the smalt schemes had been replaced by Prussian blue by the time that Kent’s paintings had been completed. Prussian blue itself might be an option, but what about the green or even the black? There again, the balustrade has been stripped for nearly a century, perhaps it is best to leave things as they are. Fortunately all I can do is to provide the information and then take part in subsequent discussions – others make the final decisions. g) Numerous other smaller projects. This is largely based on the research of Susanne Groom, a curator at Hampton Court Palace for many years, and to whom I owe so much. 3 Until the second half of the twentieth century the main constituent of most architectural paints was lead carbonate, a white compound derived from metallic lead. I very much enjoy reading about your work. I have to point out an error that the top photo (Deb Crossman) isn’t the Queen’s Staircase but the King’s.